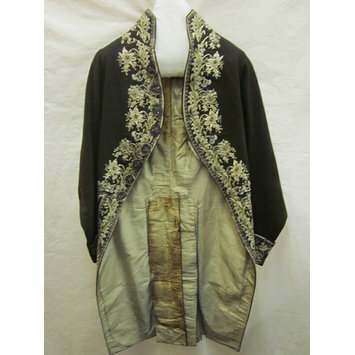 Coat from court suit, brown wool embroidered with coloured silks and glass paillettes and sequins in a stylised floral design at the collar, closing edges, tails and cuffs. The buttons are covered with metal foil and embroidered with sequins and paillettes; there are 8 on the front, 2 on each cuff, 2 at centre-back waist, 3 beneath each pocket-flap, 1 at the proper right coat tail hem. The body is lined with cream plain twilled silk, the sleeves are unlined. It fastens at the upper chest with three hooks-and-eyes. 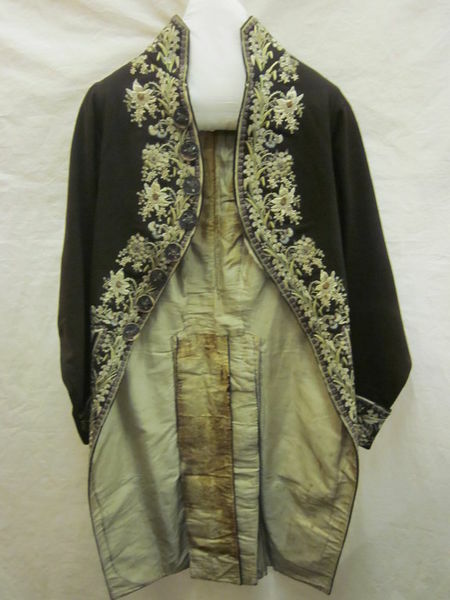 The embroidery is not matched at the seams and so it is possible this coat has been altered. Purchased in 1871 for £40 from Mr. M. Marks.